Media and Contents: 50 pages, soft cover in A4 format, numerous black and white period photos, several colour photos plus full colour artwork. Advantages: Interesting subjects mostly never before seen. Text is bilingual (German and English). Conclusion: WWII U-boats are the most popular subjects in the submarine section of plastic modelling. This magazine provides rare and interesting reference material on the subject. 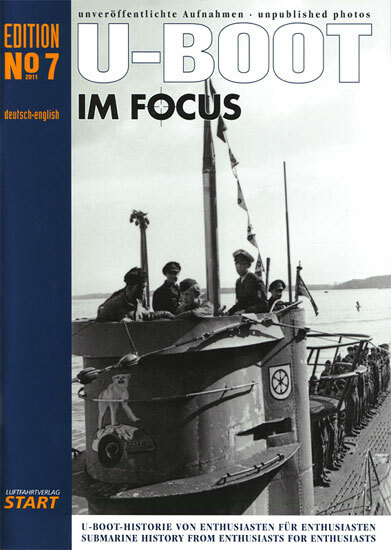 Of all the books and magazines I get to review for Hyperscale, ‘U-Boot Im Focus’ is the one I look forward to the most. As far as submarines are concerned, my main interest is in RN WW II boats but as there are neither kits nor much in the way of reference, the German U-boat arm comes a very close second. Published by Luftfahrverlag Start of Germany and usually issued several times a year, this is a sister publication to Luftwaffe Im Focus but, as the title implies, focuses on the WWII U-Boat fleet. Being Issue No. 7, the format is well known beginning with a Reader’s Forum and then into the various types of boat, Type II B, Type VII C etc. It then covers Conning Towers, Color Photos, Documents and Unknown Emblems and finally Background Information, Portrait, Unusual and Scenery. The portrait is of Kapitanleutnant Herman Schrenk who was an Officer on the Raider Thor until its destruction in Yokohama Harbour when the supply ship Uckermark, moored along side, blew up while loading ammunition. The explosion destroyed the Uckermark, Thor and two other ships moored near by but Schrenk survived having been blown overboard by the first blast. He then joined the Ex-Italian submarine UIT-23 and U-178 and after a training course in Danzig took command of Type XXI U-3511. There are several interesting photos of Thor in camouflage along with a full colour painting of the explosion in Yokohama. You won’t find much on Kretschmer’s U-99 or Prien’s U-47 but rather the lesser known boats and characters that would otherwise slip by unnoticed.